WEB: 2013 Special Blend Site Kicks Off 21 Years! 2013 Special Blend Site Kicks Off 21 Years! 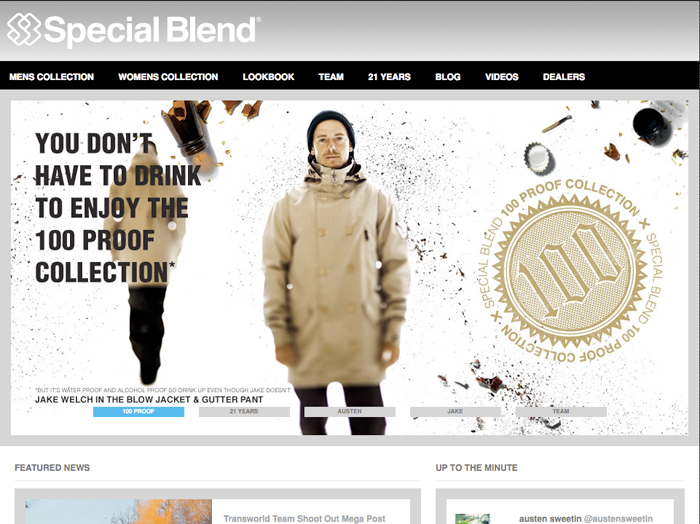 This year marks Special Blend’s 21st birthday and we’re kicking it off with a brand new site – check it at www.special-blend.com. The last twenty-one years have been a complete blur of riding, traveling, partying, new tricks, new friends, new designs and way too many drinks. We’re happy to say that the 2013 Collection brings you innovative outerwear designs that keep you comfortable and protected, all while making you look your absolute best from First Chair to Last Call. In celebration of 21 years is Special Blend’s 100 Proof Collection dedicated to those who require top shelf quality. The 100 Proof Collection is founded on distinct looks, cutting edge style, and fits tailored for snowboarding. We can truly say there are good times behind each and every men’s and women’s jacket and pant. Here’s to everyone’s support, good times, snowboarding, and another amazing 21 years! Check it all out at www.special-blend.com.